It’s no secret that when it comes to technology, most people want to be the first to have it – whether the product is a device or an app. We want the latest and greatest. We want to be first. We want to be part of an exclusive group that will make others jealous. It’s simple human nature, and companies know this very well. LinkedIn is one of those companies. Earlier this month, the company sent an email to 10 percent of its users, informing them that their profile is in the top 5 or top 10 percent of the most viewed profiles on the site. This caused many of those users to brag about being in the 90th or 95th percentile, giving the social media network a little extra publicity. 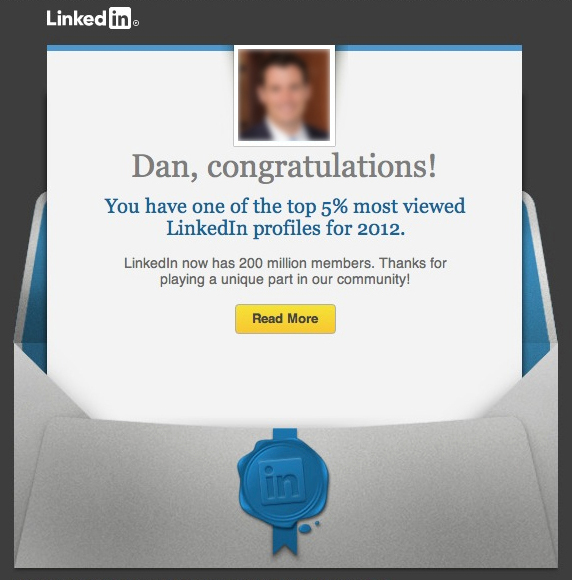 LinkedIn even made it easy for them to brag, too, providing a graphic with their profile picture and a message congratulating them on being in the top 5 or top 10 percent. Naturally, this graphic was very easy to screen grab on a smartphone and – as many people did – post to Twitter or Instagram. If you look at what LinkedIn did using actual numbers instead of percentages, you’ll immediately see that there was a calculated effort behind it. As of early January, LinkedIn reportedly has over 200 million users. Simple math will tell you that 10 percent of 200 million is 20 million, while 5 percent is 10 million. Now, which sentence below would make you feel more exclusive? B) “Your profile is one of the Top 10 million viewed on our site. To LinkedIn, both sentences mean the exact same thing, but the different wording invokes a different reaction from the reader. LinkedIn obviously knew the psychology behind the difference. Companies play these types of mind games all the time in order to increase brand awareness or to create hype for a new product. Tech companies are especially notorious for this. Not only did this approach give Facebook the time to build up their product to accommodate a large number of users, it helped them build up an unprecedented amount of hype. Other companies have taken a similar approach to building up hype for their product with invitation-only access. Gmail, Pinterest and Spotify most famously took this approach, and it has led each of the three platforms to a great amount of success compared to their respective time active. Chances are 90 percent of your email contacts have a Gmail account. Additionally, a good amount of the women you know who are active on social media probably have a Pinterest account. And it’s likely that your Facebook news feed has been speckled with notifications that your friends are listening to tunes on Spotify. 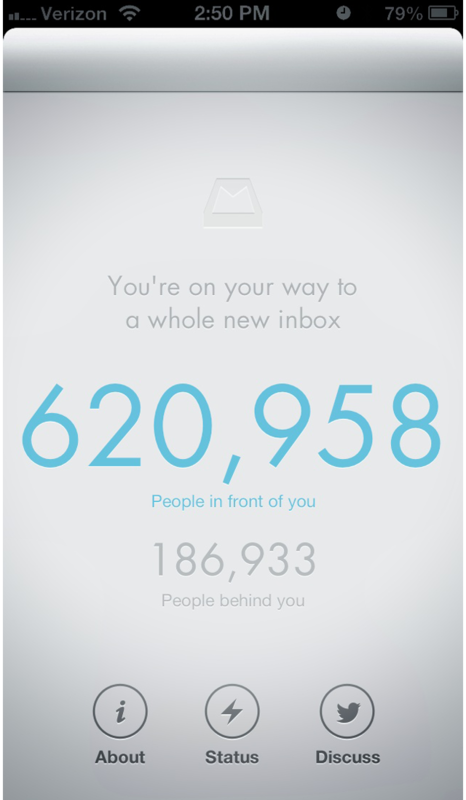 The most recent product benefiting from the hype machine is Mailbox App, an advanced email management application for the iPhone. While the app, developed by Orchestra Inc., isn’t invitation-only, it is based on reservations. Downloading the app puts you on a waiting list, and opening it tells you your exact spot in line – how many people are in front of you and how many people are behind you. Many are already using the app, some have even started and stopped using it, yet as of 9:30 a.m. on Feb. 22, there are still over 800,000 people waiting for their chance to get to use it. Mailbox checks email from the cloud in order to deliver it as fast as possible to the phone, support push notifications, and facilitate email snoozing. The IMAP protocol is nearly 30 years old and a part of reinventing the inbox is building a secure, modern API that’s better suited for mobile devices. While that may be the case, it’s more than likely Orchestra knew delivering the product like this – and coupling it with a cool video – would generate a ton of buzz, as their tech-savvy target demographic would want to be the first of their friends to get it. Orchestra definitely won’t be the last company to prey on people’s desire to be the first or to be exclusive. The next time you see another product being highly touted before it’s available to the general public, chances are the company knew what it was doing to get the hype machine going. Error - Error validating access token: Session has expired on Tuesday, 06-Feb-18 09:00:00 PST. The current time is Friday, 19-Apr-19 18:10:59 PDT.